IF the weather is right and the sun is shining, there can be few pleasures to compare with a walk in the well-kept gardens of a stately home in the southern part of England. 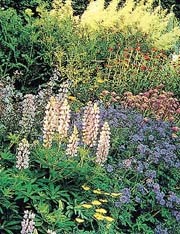 We were lucky to have found just such a fine day, to visit a remarkable estate in the summer of 1997, with an old friend, who had decided (luckily for us) that we must visit ‘at least’ one such garden before we returned to India. The visit is still fresh in my mind, as are the delicious scones with clotted cream and strawberry jam that we later ate at her home. Polesden Lacey is a gracious manor house, near Dorking — a peaceful country estate set in the Surrey Downs. The house, an elegant Regency villa, was luxuriously furnished in Edwardian times by society hostess, the late Hon Mrs Greville. A collector of fine furniture, paintings, porcelain and silver, much of which is spread all over the estate, Ms Greville ensured that future generations would be able to visit her home by bequeathing the villa to The National Trust in 1942, who have maintained it ever since. The extensive and picturesque grounds at Polesden Lacey are among the best-maintained, in the area. Charges for a visit to the gardens is 3 pounds per person, and 7.50 pounds for families. 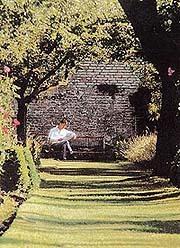 The formal gardens are closer to the manor, and include a walled rose garden, and well-kept lawns. Visitors can spend the whole day wandering around the grounds, and enjoying the landscape walks. Guides can also be booked for those who want to know more about the history of the place. The Gardens can be visited daily between 11 a.m. to 6 p.m., and between June 12 and July 4, there are open-air theatrical performances in the evenings, that have become extremely popular. The Tea-room serves a wide range of cakes and sandwiches, and families are encouraged to picnic on the grounds, outside the formal gardens. There is also a shop selling many varieties of plants. The present house was built in 1821, for a prosperous bookseller named Joseph Bonsor, replacing a mid-17th century house which had been the home of Admiral Francis Geary, and later that of playwright Richard Brinsley Sheridan. Then came another owner, Sir Clinton Dawkins, at the turn of the century, who greatly enlarged the Regency manor. Retaining the older house as the central portion of the south front, with its commanding views across the valley to the woods of Ranmore beyond, but added a whole new wing to the north, with a new internal courtyard. In 1906, the house changed hands again, and was bought by Captain the Hon Ronald Greville. A man of fastidious taste, Captain Greville brought in the architects of the Ritz Hotel, Mewes and Davis, who redesigned the interiors with the help of the well-known decorators of the time, White, Allom and Co. Most of the alterations were completed by 1909, the date when King Edward VII, paid a visit. By then Captain Greville was no more, having died the previous year, but his widow continued to entertain distinguished guests at Polesden Lacey. The renovations begun by Captain Greville, went on till at least 1921, when his widow decided that the manor was finally complete. Ms Greville was the only child of the Rt. Hon. William McEwan, M.P. for Edinburgh, who founded the famous Scottish brewery of the same name. His wealth laid the foundation for Ms Greville’s social prominence, and enabled her to become one of the most famous hostesses in the period between the reign of Edward VII, and the World War II. Many reports were written by society columnists, and recorded in the memoirs of many guests, of weekends at Polesden Lacey, under Ms Greville’s regime. The setting, the food, and the company combined to create an atmosphere of great comfort and style in the twilight years of country house society. Osbert Sitwell described the hospitality as "a kind of unobtrusive luxury of life and background never encountered elsewhere." The collection of paintings, furniture and porcelain bought by Ms Greville from top London dealers, provided the ‘stage set’ for her entertaining, both at Polesden, as well as her London home at Charles Street, Mayfair. She drew her friends and guests from all walks of life, but showed a distinct preference for politicians and royalty. Many crowned heads of state, stayed and were entertained at Polesden. According to records, three generations of the British royal family stayed there — Edward VII, George V and the future King George VI and his bride, the present Queen Mother, spent part of their honeymoon at Polesden Lacey in 1923. The quality of the food served at Polesden was often remarked upon, and menu books are preserved in the house with impressive guest lists written opposite elaborate menus. Ms Greville’s close friend, Beverly Nichols wrote of the tea table at Polesden — "rich in charming detail" with its Queen Anne silver, Meissen porcelain and monogrammed Chantilly lace. After Ms Greville’s bequest of Polesden Lacey to The National Trust, the furniture, pictures and other contents were brought in from her London home. The rooms were also rearranged, to make them more interesting for visitors. Visits to stately homes in UK usually cost quite a lot of money. And a visit inside the house is an extra 3 pounds per person, and 7.50 pounds for families. However there is concession for groups, and combined tickets for visits to the house and gardens, are 5 pounds for groups of more than fifteen persons. The tour starts from the pillared staircase and gallery balustrade, installed for the previous owner, but maintained by Ms Greville. The cabinet on the stairs contains a rare collection of 16th century Italian majolica, which are a variety of earthenware, with a tin glaze. The plates in the collection are painted with biblical and mythological themes. Next to the cabinet hang early 18th century Flemish tapestries depicting Caesar and Cleopatra. The ‘Dining Room’ was decorated for Mrs Greville in neo-classical style, and hung with crimson silk damask, replaced after a fire at Polesden in 1960. She always had her father’s portrait hung on a wall behind her chair in the ‘Dining Room’ at Polesden as well as in her London house at 16 Charles Street. 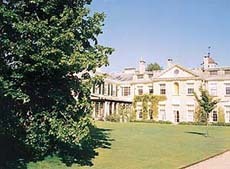 Mr McEwan spent much of his time at Polesden, and left his daughter as estate of more than 1,500,000 pounds sterling. In the ‘Dining Room’, Mrs Greville’s collection of silver is also displayed. Also worth seeing are some furniture, veneered with imported oriental lacquer. The ‘Corridor’ is a virtual art gallery, with a number of early and later Italian, Dutch, French and Flemish Old Masters. Also displayed in the ‘Corridor’, are four large Mandarin vases — Ch’ien Lung dating back to 1736. In rose tints these exquisite pieces and other goldfish bowls, are displayed on English giltwood stands. The ‘Library’, is decorated in the late 17th century classical style, with a hand-dyed Indian carpet and striped curtains. Fine 17th century armchairs upholstered in needlepoint, are disposed about the room. A rather feminine room, the ‘Library’ was a place where Ms Greville may have spent much of her time. On the Regency mahogany writing table stand photographs of Ms Greville’s parents. A small cabinet with tortoise-shell and ivory veneer to the right of the door was a present from the Queen of Spain. Over the fireplace hangs the portrait of a boy by Caesar Boetius van Everding in (1606-78), and also on display are a number of blue and white Chinese porcelain pieces, including four large 18th century Mandarin vases, flanking the doors. However it was ‘The Study’ beyond ‘The Library’, which was her haunt. Added by Mrs Greville to provide a private study for herself, it is where a larger part of her precious porcelain is displayed, as well as a rare Furstenberg tea and coffee service humorously painted with monkeys dressed as humans. On the Carlton House writing table, there are miniature portraits of Mrs Greville’s parents and her husband, Captain Ronald Greville. The most spectacular decor at Polesden Lacey is in the ‘Drawing Room’, earlier known as ‘the saloon’, during Ms Greville’s time. Its opulent interior, circa 1700, was imported by Ms Greville from an unidentified Italian palace. After a fire in 1960, it took 18 months and over 2,000 books of 24 ct Gold leaf to regild it. The ‘Drawing Room,’ with its Central Persian carpet, is also where Ms Greville’s best 18th century furniture can be seen. Worth seeing also is the ormolu and cut glass chandelier, made in 1860 by the French firm of Baccarat. During her lifetime, Ms Greville presided over her tea table ‘promptly at five o’clock’, at the fashionable ‘Tea-Room.’ Decorated entirely in French taste, it has Louis XVI wood carvings and 18th century painted panels of pastoral scenes. Beverly Nichols wrote about Ms Greville’s teatime service, "The cream has been extracted from some very expensive breed of cow on the home farm. It is so thick that Americans have been known to mistake it for custard." The scones served here were specially flavoured with cinnamon, for Queen Mary, consort of George V.
The western range of the ground floor at Polesden Lacey, was a male preserve, consisting of the ‘Billiard Room’, the ‘Smoking Room’ and the ‘Gun Room’. The ‘Billiard Room’ was reopened in 1976, and its furnishing was based on a photograph published in the Illustrated London News of 1923, commemorating the honeymoon of the Duke and Duchess of York. The Smoking Room is like a small museum, and contains photographs, scrap albums and cabinets of memorabilia, offering an insight into the personality of the woman who imbued Polesden with its evocative Edwardian ambience, and who ensured its preservation for posterity.